1. 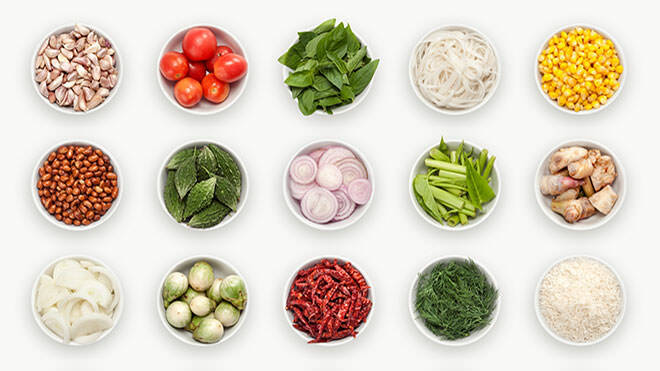 For the Thai curry paste, combine the garlic cloves, green chillies, lemon grass, coriander roots, galangal, shallot, lime rind and juice, salt, cumin, coriander seeds and peppercorns. Grind to a smooth paste using a mortar and pestle, or tip everything into an electric food processor and blend. 2. Heat the groundnut oil in a wok over a high heat. Add the chicken thighs and fry for 10-12 minutes, turning frequently, until they're golden all over - the chicken should be cooked through. Remove from the pan and leave on one side while you make the curry. 3. Turn the heat down a tad and pour in 250ml of the coconut milk, followed by three tablespoons of the green curry paste. 4. Add the bamboo shoots, baby corn and mushrooms, stir to mix and pour in the remaining coconut milk. Bring to a simmer and tip in the red peppers and beansprouts. Return the chicken to the pan, reheat and scatter with coriander leaves and Thai basil before serving.